This is a partial and very inadequate gloss of a wonderful Aye Talk given by Isobel Lindsay, a member of the board of the Scottish Left Review, and recently posted on Bella Caledonia. Isobel’s talk provides the perfect theoretical foundation for the ‘Songs for Scotland Project’, which was announced but not explained in detail in another Bella Caledonia post of May 30th. At the time we were still putting the finishing touches to the project, which is ready to go. Now it is moving forward from the theory so elegantly presented by Isobel towards the praxis she advocates: using our national identity and shared mythos to bring more of the Scottish electorate into the ‘Yes’ camp. The project consists of two related and mutually reinforcing sub projects: the Songs for Scotland Festival, which will be held in the beautiful upstairs venue of Oran Mor, in Glasgow’s west end, on the evening of September 3rd; and ‘Bella Caledonia: the Songs for Scotland Album’ (downloadable) which will be ready for download by August 15th (more below). The Songs for Scotland Festival will present performances by some of Scotland’s finest singers and musicians. Artists from folk/trad to hip hop, with songs ranging across the full spectrum of Scottish music, from Emily Smith to Adam Ross of Randolph’s Leap. They will perform on September 3rd in a shared celebration of Scotland and to affirm their support for ‘Yes’, singing variously in Scots, Gaelic and English. ‘We call on Scotland’s singers and musicians to become fully engaged in the referendum debate, and to bring song and musical repertoire into prominent play’, I wrote previously. Our singers and musicians have risen magnificently to the occasion. Some have rearranged busy schedules to perform at the festival; and all are freely contributing their time and their artistry to the cause of good governance, social solidarity and Scottish independence. The Festival will be hosted by author and playwright Alan Bissett . Award winning movie production designer Mike Gunn (‘Sunshine on Leith’, ‘Filth’) will be designing the event, to make the Oran Mor venue, if possible, even more lovely than it presently is. The Festival will be a first class event and a shared affirmation of Scotland: a truly national concert in which Scottish musicians will sing and perform their support for a ‘Yes’ vote on September 18th. Crucially, the event will also be professionally filmed by Mark Hirst, the film-maker behind Bellavision which has been webcasting recently on Bella Caledonia. Why crucially? A well-designed festival with fine musicians is a beautiful but a fleeting thing: here today, gone tomorrow. The Songs for Scotland Festival will be staged only two weeks before the referendum. Mark and his crew will be both filming performances and interviewing artists (those willing) about their personal roads to ‘Yes’. They will cut this material into short episodes of five minutes each, one per artist or band and each to include a song; and these episodes will then be webcast on Vimeo and YouTube as the ‘Artists for Indy Interview Series’. By thus bringing to mind certain core elements of our national mythos, we believe we can bring more voters onside with us during those final, critical weeks before the vote. We expect the ‘Artists for Indy Interview Series’ to be widely viewed across Scotland (with a little help from social media); and moreover, we think the series will inevitably cause our splendidly egalitarian national mythos to well up in many a mind just in the nick of time. Many of the artists performing on September 3rd, and others too, have consented to the use of some of their recorded performances to create a downloadable album of ‘aspirational’ songs about Scotland: ‘Bella Caledonia: the Songs for Scotland Album’. Album downloads will help us to fund the festival in the first instance, and will continue to be available through Bella Caledonia after the concert. Why are schools teaching us to use stones to plug the hole in the raft? We are using Indiegogo to fund the project (basically as a sales platform for tickets and albums). To see the complete festival lineup at the time of writing, please go to Indiegogo, here. While the lineup is eighty percent complete, there are still artists seeking to adjust their schedules so they can join us on September 3rd. We will continue to announce artists as they confirm, both on Bella Caledonia and on Twitter @songs4scotland. Certain special guest artists will also be performing who have asked to remain anonymous until the day of the Festival. The Oran Mor upstairs venue will accommodate 400 (with seating for only 350), and we expect tickets to sell out fast. Pledging your support soon will guarantee your place at the Festival. Finally, Mike Small and I would like to thank the artists who will be taking centre stage on September 3rd to create a great event; as well as the many other talented and energetic people who are pooling their efforts to put thegither the Songs for Scotland Project. This is wonderful. I read HM Govt’s leaflet through our letterboxes this morning (almost missed it, the postie had wrapped it in the midst of a junk mail magazine). It was so uninspiring. No vision. All head and no heart. Just an appeal to the hip pocket and insecurity with lots of pictures of comfortably off people. That’s been the framing of the debate so far, holding it within parameters of comfortable discourse. Now is the time for the soul to start coming in. Such is the bardic function of artists – to speak to the soul of the people – to call them us back from out of spiritual death. Watch out, by the way, for the forthcoming independence poetry anthology from Luath Press, Scotia Nova, currently slightly delayed by staff changes. I might be off topic but after September we can’t use “Oh flower of Scotland” as our national anthem. If it’s a no then I’m not singing “we can still rise now, and be a nation again”. If it’s a yes then we need a flower of Scotland II, and sing less about a battle many years ago and move on. It still has to have the same passion when it’s sung at a sporting event though! Almost every other nation on earth has an anthem that revels in spilling bloodshed with another country in some battle that happened hundreds of years ago. Imagine how proud we would feel if our anthem instead celebrated all the people in the world who’ve chosen ,for whatever reason, to come to Scotland, to live here, work and make it a better place. Thanks Alastair, we need more soul and less stats… sing up sing on! Thanks for your kind comment. Well spoken and well said. Bitter Thegither has deluged us with drab, hip pocket directed propaganda, and that will confirm their base for them, a group who have essentially abandoned critical thinking. And it will attract some from that mass of undecided voters in the middle too. But will it confirm these undecided votes for ‘Naw’? I don’t think it will, necessarily. Last night I had the really incredible pleasure of attending the premiere of Allan MacDonald’s ‘The Bruce 700’ in Stirling. There were times during the performance when the piece successfully replicated the battle at Bannockburn, battle cries, clashing swords and all; and Kathleen MacInnes, with her unparalleled voice conjured the wild cry of a highland lass on a misty morning ages ago to perfection. What a performance! There was a detectable current running through the packed house at the Albert Hall during the performance, almost a murmuration. When starlings fly by the tens of thousands in perfect formations, they aren’t doing that by sending each other memos about the cost of living. They use other, deeply rooted signals to enable this behaviour. We need to create a murmuration in the Scottish electorate before September 18th, by also conjuring deeply rooted signals. What might these signals be? Check this, by Alan Macdonald, ‘speaking to the soul of the people – to call us back from out of spiritual death’ and ponder this question as you do. Agreed that we need more heart and passion in the debate. I remember living and working abroad for a year and becoming incredibly homesick for Scotland. The trigger was hearing Wild Mountain Thyme. Even though I was happy at my work, enjoying a new culture and had made great friends in a beautiful Italian coastal town I just became incredibly melancholy when I heard the song. I saw a quote from Sorley MacLean about Gaelic (which I can never find now) and how even if Gaelic fell out of popular use, and was considered a ‘poor’ language, it didn’t matter because it wasn’t poor to him and even it was it was his language and he loved it. That’s how I felt about Scotland then and that’s how I’ll always feel about it. I believe Scotland will be a better and fairer society under independence but even if there are some years where we’re economically worse off I will always love Scotland more than anywhere else in the world and don’t want to live my life anywhere else. I can’t explain it fully but I don’t have the same love for England, Wales or Northern Ireland even though I’ve spent time in all of those places and enjoyed the company of the people there. I think that the debate will gradually start to stir people’s emotions nearer to September and I think that can only be a good thing for Yes. Good comment Juan. I too believe we should calculate gross national happiness over and above GNP. Here’s a new welcoming song, “Scotland – The Welcome Table”, written by Eilidh Mackenzie for a modern Scotland. The singers are both still in their late teens (Calum Barker from the Black Isle and Eilidh Cormack from Skye). To me this song epitomises the upbeat, optimistic nature of the movement towards independence for Scotland; and it also is very ‘singable’! 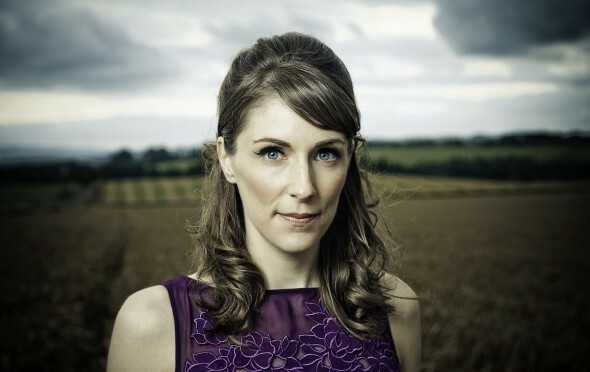 Rod, Eilidh MacKenzie will be performing at the Festival on September 3rd. I don’t know what she has planned exactly, but this song makes perfect sense to me! Do you have tickets yet? There is a link to the ticketing site at the upper right hand corner of the Bella Caledonia home page. Whether you can come or not, whatever you can do to spread the word (via Facebook and so on) will be appreciated. Thanks for that info. ‘Songs for Scotland’ is a great concept and I know it will be a great success in helping to inspire enthusiasm for Scotland and its independence movement. Would certainly hope to make it down to Glasgow if my old bones can take it! I’ll certainly do my bit to help spread the word and have already shared to Twitter and Facebook. Good luck with the fund-raising on Indiegogo. Please take the time to learn about this important and inspirational project. I have volunteered my musical services. Perhaps if you’re one of my musical friends you’d like to do the same. Otherwise please consider supporting the initiative and buying the album (out soon, see article for details). See you there I hope, and thanks for putting this on your wall and generally spreading the word. Best! And thank you too for your kind offer of helping out. A resounding maybe! You can write to me at songsforscotland@gmail.com. Let’s talk! Janet shoot me a note at songsforscotland@gmail.com. The only way to buy tickets right now is online. Is that not possible for you? If that is so I should maybe creating some other ticketing arrangements too. I’d love to connect. I tried friending you on Facebook.